Some of our Instructors and Divemasters you might see around the Sairee Cottage dive shop. 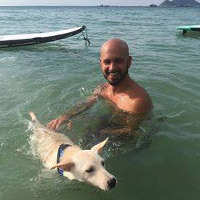 Hi All, I’m Trevor the owner of Sairee Cottage Diving Koh Tao, I’m a PADI and SSI diving Instructor but spend my time enjoying this beautiful beach from the view of a hammock! 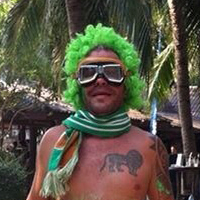 Originally from north Dublin I have spent a lot of my 20′s traveling the world, after some restless years I finally ended up in Thailand and then Koh Tao. Here I fell in love with the island life style and the underwater world. After spending 4 years working as a Dive Master and Videographer I decided it was time to take the leap and open my own dive shop. I take great pride in making sure all our customers receive the special treatment they deserve on there dream diving holiday. 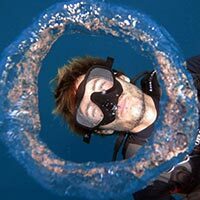 PADI Master Instructor at Sairee Cottage Diving, Dominic or ‘Bear’ taught diving for over 12 years. 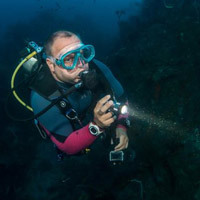 His instruction has received recognition of excellence from PADI. He is also a PADI Technical diving instructor, Sidemount instructor and mixed gas diver having conducted dives to 100m deep. Bear is now the Dive school manager. Barry is in house a.s.s.e.t. technician at Sairee Cottage Diving, PADI instructor and speed boat captain. 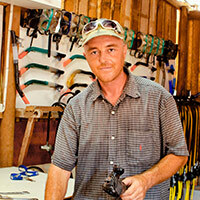 His extensive knowledge on equipment and the local dive sites make Barry one of the best dive leaders around. Barry offers regulator and b.c.d. servicing to all our customers at very reasonable prices. Hey guys! My name’s Maddy and I’m originally from Montreal, Canada. I was first introduced to diving in 2010 when I was backpacking Australia, and it was a love at first descent. A few years later I started a backpack trip around South East Asia with the intent to do some diving; little did I know my passion for diving was only starting! I reached Koh Tao and knew it was meant to be. 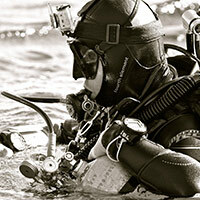 I took my first steps into professional diving, started my Divemaster training and never looked back. Now a Master Scuba Diver Trainer I could not be happier. My office is the ocean, I get to show people something exceptional every single day and meet people from all over the world. We are all truly living the dream here at Sairee Cottage Diving! Come and share that dream! 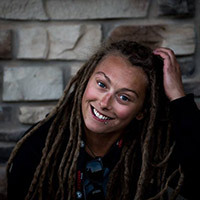 Originally a member of the SCD team early as 2010 she excelled as a Dive master here, she spent some time working in Central America as PADI Instructor and on the west coast of Thailand running live aboard trips around the Similan Islands. 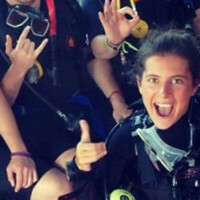 A few years teaching at one of the biggest dive schools in the world has given Denja mastery of SCUBA instruction, always knowing how to get her students to feel comfortable in the water. Now back home on the team at Sairee Cottage Diving she can teach in German and English to all her lucky students. Gal is Sairee Cottages very own International Man of Mystery, no one really knows where he came from, he just appeared at the shop one day in full dive gear and was immediately hired on as our Head Dive Master! 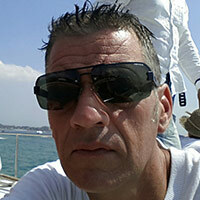 True James Bond Style his hair remains immaculate as he shows you the wonders of the underwater world. Although unconfirmed, it is rumored that he sleeps in a swim through at Green Rock surrounded by an army of Trigger Fish. Originally from Chiang Mai in Northern Thailand, Aom has given up the hustle and bustle of Thailand’s second largest city for the tranquility of life on Koh Tao. She is the friendliest person and the first face you see when you come to Sairee Cottage Diving. She deals with all the madness so that we don’t have to and whilst working in the dive shop, she is also completing her Divemaster training. If you think you see a Ninja while diving, it’s probably Aom in perfect trim with her Sidemount equipment. Looking forward to seeing everyone! Sairee Cottage Diving Koh Tao has introduced me to the underwater world and since my Open Water course, I have never left the place. If you had asked me a few years ago if I would ever live on a tropical island I would have called you insane. From being indoors most of the day, working in visual effects, getting excited about graphics cards and huge Photoshop files, I now spend every day, almost all day outside in the sun and underwater, where introduce people to the amazing underwater world. I have become quite accustomed to island life and have abolished the concept of shoes, toilet paper, traffic jams and the like. I think you should do it too, come and join the family at Sairee Cottage Diving! Heya! 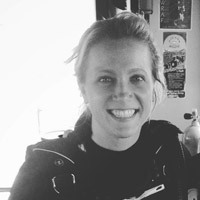 My name is Andie and I’m one of the divemasters at Sairee Cottage Diving. I begrudgingly dragged my feet to this island in May of 2015, convinced I wouldn’t like anything about it; oh how wrong I was! I did all of my training through SCD and then was lucky enough to get a job here too! I love spending my days talking about fish and showing people around the underwater world– plus, my work colleagues double as my family abroad! What more could you ask for? Come dive with us to see what it’s all about! See you in the blue! Originally from Essex in England I’ve always loved being in the water, so much so my mum toId me that when I was 9 I told her I was going to be a scuba diver, and here I am now a full qualified IDC Staff instructor living the dream working for Sairee Cottage. I started diving in 2002 in Australia while taking a “gap year” which I’m still on. Since then been diving all round the world from Argentina to Micronesia and many places in between. Before working at Sairee Cottage I spent 8 summers dj-ing in Greece, During one winter season I came to Thailand travelling, was on Koh Tao so decided to do my Divemaster course at Sairee Cottage, the rest as they say is history. I was only coming to Koh Tao for 2weeks it’s been just over 3 years now, you have been warned with the diving and island life you might not leave either. Decided to become a dive pro 2 years ago, I moved to Koh Tao 2 years ago. Gone by many nicknames since then like BJB, Bobby Bucher, at the bar Bob, on the ball Bob, Bobby green fingers, and finally “the Count”. I’ve been the joke of the dive shop but I love everyone who takes a laugh at me. I love my job and I love teaching! My goal is to get everyone I meet to get hooked on diving! The underwater world is a place of peace, tranquility and adventure! Born and bread in crazy city of Bangkok. Got a degree in computer science. Spent 2 years in Sydney being lost. Spent over a decade in Belgium building a family life. Then got hit hard with midlife crisis, finally I decided to turn my life 180° and found my peace underwater. When passion and sense of purpose are aligned, true happiness is right there. And now I got to witness people falling in love with the same thing I do on daily basis. How greater can life be! Hey there, I’m Katie O, or if you like you can call me Noodles as some of my nearest and dearest do. Originally from Montreal, Canada my diving journey started back in 2009 on my first backpacking trip. I came to Sairee Cottage on a recommendation back in the days where confined was done in the sea and the classroom was the restaurant. I was supposed to stay for a week or so and as many do, I fell in love with diving and the charm of the SCD family. Plans changed and I stayed a month and a half until I ran out of money and had no choice but to go home. I cried my eyes out when I left and vowed to come back one day and follow my dream. It took 8 long years but in 2017 I returned on holiday and felt like I had never left. Between then and now I have completed my training from Rescue Diver to MSDT. This basically makes me the longest zero to hero SCD has ever taught, taking 10 years to go from my first dives to a full-fledged instructor and staff member. Dreams really can come true! At home I worked as part of the support team for film making crews, love live music, skiing and hanging out with my stinky old man dog Levi. It certainly wasn’t a bad existence, but it’s nothing compared to introducing people to life underwater. 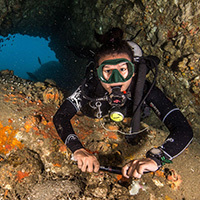 The diving on Koh Tao is exceptional and not just for the big stuff like whale sharks. I get super giddy about all the tiny macro life we have here, like nudibranchs and shrimp. Yes, they can be hard to spot but don’t worry, It’s my pleasure to help you fine tune your macro-senses! It also warms my heart to see a new diver so excited about the new world they are introduced to. I remember being that baby diver clearing their mask every few minutes because of the grin plastered on my face, and seeing this in others feeds my passion for teaching. I really am living the dream; living in a little coconut grove with some of my best friends on a paradise island working quite possibly the greatest job on earth. It took some time, but it’s better late than never to make passion a way of life. I’m so excited to share it with you and welcome you into the Sairee Cottage Diving family like I have been. I’m James! Born and raised in London England and I love diving. Some people describe me as caring and patient, thanks mum. Before I got into diving i had my own vehicle repair company but that was not my passion. I started diving in 2015 and it didn’t take me long to realise that this is where I belong. That feeling of being weightless, being able to move up and down with just your breath, being able to move your body in ways that I can only describe as like being in space. The peaceful tranquility, the beautiful marine life accompanied with the sudden change to our senses in sound, sight and gravity makes it an out of this world experience but on this world. I love showing my students all these pieces that are so special to me and seeing their faces when they get it. I came to Sairee Cottage Diving to do my professional training and I discovered that I love helping people learn, develop and evolve. My mission is to inspire.